A free flowering biennial that blooms very early in the spring. Compact plants produce large, beautiful flowers in a wide range of colors. Excellent in beds and rock gardens as well as cut flowers in a small bowl. 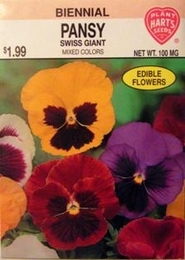 Pansies prefer a rich moist soil and will tolerate partial shade. Keep flowers picked for longer blooms. Planting time - Winter indoors for same year blooms, Early fall for next year blooms.